The Arctic has seen a dramatic transformation in recent years, with significantly warmer temperatures, lower levels of sea ice, and more open water. In November, the average Arctic sea ice extent — the measurement scientists use to represent the area of ocean where there is at least some sea ice — was 17.7 percent below the averages from 1981 to 2010, according to NOAA. That’s the lowest November extent since the NOAA began keeping records in 1979. At the moment, temperatures at the North Pole are about 50 degrees Fahrenheit warmer than normal. 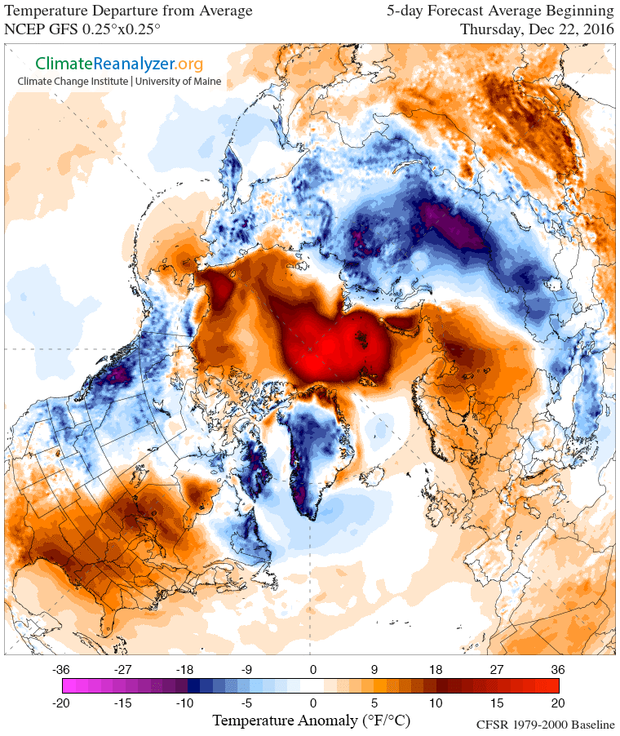 Meteorologist Jeff Berardelli of CBS affiliate WPEC explains that “essentially a conveyor belt of very warm, most air” is currently pushing north into the Arctic. The ongoing warming trend is hardly news to people in the region, where Mayewski does field research collecting and analyzing snow samples and ice cores. “For the people in the Arctic, no one has to tell them an abrupt climate change has hit,” Mayewski said. But, he noted, the same cannot be said for people living farther down in the Northern Hemisphere who are unknowingly experiencing the ripple effects of Arctic warming. “They assume the Arctic is far away, and they assume, ‘What impact could this have on us?’” Mayewski said. But Arctic warming is directly tied to extreme weather in the Northern Hemisphere, he explained. With the barrier between the cold north and warm south weakening, cold air masses are more easily moving south and warm air masses are more easily moving north, fueling the changes in surface ocean currents that can exacerbate extreme weather events. In addition, as sea ice transforms into open water, that open water absorbs more heat, a cycle of warming that increasing moisture levels and raises the odds of events like floods and droughts throughout the hemisphere. Mayewski cited a long list of recent extreme weather events in the Northern Hemisphere: the drought in the western United States, the historically cold East Coast winter of 2014, the initially mild winter of 2015-16 that suddenly gave way to record cold temperatures. “All of this points to instability,” he said. In historical perspective, Arctic warming over the past five years is “as fast and as large a magnitude” as the warming that occurred during the last vestiges of the Ice Age 11,500 years ago — the transition that gave birth to our modern climate age, Mayewski said. The Arctic’s climate system has followed largely linear patterns until now. “While none of the global climate models predicted we’d have an Arctic warming so fast, it no less happened. The models are based on input from the last few decades. We’re experiencing something which is a surprise, a quick change in the climate system,” he said, citing the rapid release of greenhouse gases and the hole in the ozone as accelerating factors. As the Arctic continues to warm, it will release dangerous amounts of the greenhouse gas methane, which absorbs the sun’s heat and further warms the atmosphere. In the first two decades after its release, methane is 84 times more potent than carbon dioxide, according to the Environmental Defense Fund. Now, with warming well underway in the Arctic, climate scientists stress that the only way to change course is to dramatically mitigate the rise of greenhouse gases worldwide. President-elect Trump campaigned on the promise to withdraw from the international climate accord. Earlier this month, Donald Trump said he is “open-minded” about climate change — but added that “nobody really knows” the truth about it, contradicting the near-universal scientific agreement on the issue. This year from January to November was the warmest such period for the Earth on record, according to NOAA. That follows another record-breaking warm year in 2015.